The crystalline lens is a transparent structure in the eye, situated behind the iris, and its main function is to focus the light on the retina. 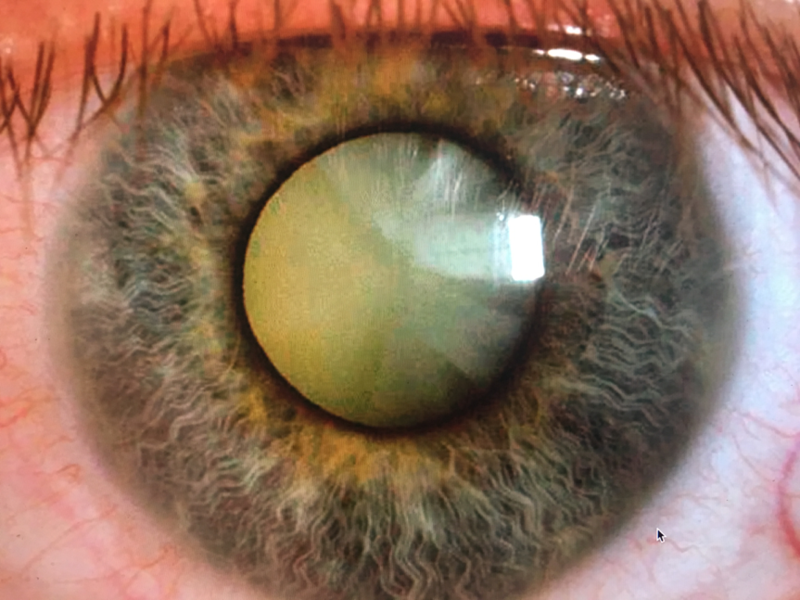 A cataract is a naturally occurring aging change of the crystalline lens. The lens becomes cloudy and loses its transparency. This process is usually very gradual and results in slow decrease of vision, colours appearing less vivid and some patients might be also aware of glare. As cataract is a normal aging change, most people above the age of 60 will have some degree of cataract. However, cataracts might be encountered at a younger age if there is previous history of ocular surgery, trauma, diabetes or inflammation. Rarely, cataracts may be hereditary or congenital (when one is born with a cataracts). What is the treatment of cataracts? In the early stages, the vision can be corrected by changing of the spectacles. However, the definitive treatment is surgical. With the advancement of technology, cataract surgery has become a much safer procedure. It is usually done under local anaesthetic as a day case. The surgery is called phacoemulsification and intraocular lens implantation. During the operation a very small self sealing incision is made into the cornea. The lens is removed by using ultrasound (phacoemulsification). The ultrasound helps to break down the cataract into small pieces so that they can be cleared away through a small incision. Once the cataract is removed, a new foldable lens is inserted into the eye that will help focus the light into the retina. When is the right time for the cataract operation? Cataract surgery is an elective procedure and the decision when to operate is strictly individual. Once cataracts start interfering with one’s quality of life then it would be appropriate to consider the cataract surgery. It is no longer required to wait until the cataracts are “ready” or “ripe” to undertake the surgery. However, if the cataracts are not causing any symptoms and the patient can do all his/her daily activities the surgery can be deferred till later date. Are there any risks/complications with cataract surgery? Nowadays, cataract surgery is considered to be one of the safest operations however there are still small risks. The most serious risk is of an infection or a severe bleed that can lead to loss of sight. Fortunately this is extremely rare. It occurs in less that 1 in 1000 patients. Other more frequent, however, not as serious risks include inflammation, disturbance of the capsule, where the new intraocular lens should be implanted, or some lens fragments dropping to the back of the eye. All these can be successfully managed either conservatively or with further surgical procedures. Vitreoretinal surgeons are well trained in managing the surgical complications of cataract surgery.